I'm just relaxing today after the long, and rather cold, journey home from Dundee. A lovely bubble bath and a warm bed was enough to banish the chills last night though! paper and a Jolly Nations stamp ( PNO30Q Sleigh) which decoupages very well of course. I also added chipboard trees from the Swell Noel box and a lovely snowflake (each one layered, glittered and with a gem in the centre) also from the latest K&Co range - these are gorgeous, and, as the ladies this weekend know, should be grabbed if you see them, as they disappear from the shelves very quickly indeed!!! I travelled on up to Dundee, and from there to Broughty Ferry on friday evening... it was getting colder and by the time I went down to dinner it was snowing. My hotel was literally across the road from Kitty Krafts, as you can see in this picture which I took from my window on saturday morning...very handy! I met some lovely ladies there and was thrilled when Hazel appeared...Hazel had posted that she would love to come along, but as she has agoraphobia she didn't know if she would be able to. So well done Hazel, you should be so proud of yourself! 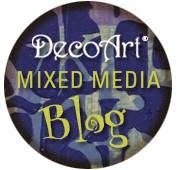 Check out Hazel's blog at Dido's Designs. Hello to everyone else who came along - as you can see...it was smiles all round! This comical line of penguins uses "Have an Ice Christmas"(Funstamps FM208) which is a penguin and polar bear - by just using the penguin several times, cutting away the back wings and adding wings cut from black card, I created the idea of them all holding on to each other and slipping over. Add seperate feet for the bottom two to complete the effect. Notice the lovely snowflakes agai n?! pop out window effect card. This one has the delicious Christmas Cheer papers combined with chipboard icons from Swell Noel. Well, that's all for now - check my dates section to see where I'll be next and for workshop dates when I will be doing at Topaz Crafts. Awww, love your penguin card, that's really cute. And how nice to read Hazel came to see you, it's like our little blogging community - awwww. Well hun, I'm tagging you! It's fun, no really!! Have a nosey at my blog to see what I'm on about. I know your a busy bee though, so please do not worry if your too snowed under (hoho). Thank you for a great demo day on Saturday, we all loved it and can't wait to see you again. The weather was terrible and only got worse for Sunday but did have a lot of ladies who couldn't make it over the weekend want to know when you were coming again, maybe when there is NO snow. Met you this weekend at Kitty Krafts demo day. I'm so glad I was able to come along. Your cards are fantastic and have given me the inspiration to get started with my Christmas cards. I arrived home with my basket of goodies (and I got the fab snowflakes too!) and got started. Hope you will be able to make it back to the east coast soon. Take care and haste ye back.